Today daddy mummy woke up very early around 6 plus just to get ready to the hospital for mummy's glucose test. However, they didn't know that mummy need to fast before the blood test. Thus, mummy took half a cup of milk before going to the hospital and the test cannot be proceed. They were so unhappy that their midwife didn't inform them the procedure before the test. They had to wait for another 1 hour for the checkup appointment in the hospital. Since they were here one hour earlier, they were the first to see the midwife when the clinic opened! The midwife Jessica checked up mummy's blood pressure, my size and heartbeat. Everything went well. Fundal height is 28cm. Jessica said it is a good size. For 28 weeks pregnancy (actually should be end of 28 weeks), the measurement is around 27-31cm. I am growing well. My position is head down now and my back is facing the same side as mummy's back. When Jessica tried to hear my heart beat using her monitor, I kicked the monitor away! Midwife, dad and mum were laughing when they saw that happen. Mummy thought it could be I know that Jessica was pointing on my feet then my heart. Mummy has to go back to the hospital for the glucose test again on Monday. Then in 3 weeks time, we will see the doctor for futher checkup. Daddy mummy received a lot of past down clothes, new clothes from aunties uncles for me, of course also some clothes that they bought for me. Therefore, they decided to start putting these clothes into my wardrobe. 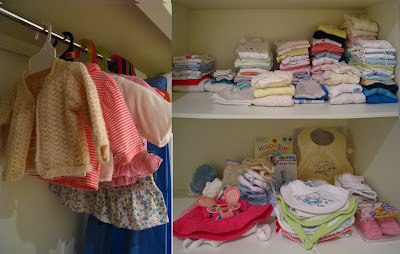 They spent a few days washing all my clothes, sorting them out according to the size and finally they managed to arrange the clothes properly into my wardrobe. Daddy mummy even went to IKEA to buy some hungers for me, and also clothes organiser and laundry bag. Daddy said I have too many clothes, more than the combination of mummy and his clothes. This is how BLESSING I am!!! Isn't it a lot?? There are more to come when kong kong po po, kao fu and ah ma come over!! The middle rack is full of all my sleeping and going out clothes. The lower rack is for my bibs, hats, shoes, shocks, mittens, booties and other accessories. The next wardrobe is for my pretty dresses and cardigan. Are you jealous??!!! Mummy's company required them to wear formal working clothes, however, now because I am growing, mummy no longer can wear her working clothes. So today daddy and mummy went out from morning till evening hunting for mummy's working clothes. After visiting a few maternity shops, daddy mummy ended up at one of the maternity warehouse near the city called Pea in a Pod recommended by one of the lady that mummy met today. It is indeed a maternity wear warehouse, with huge range of maternity wear (the biggest mummy ever saw in Melbourne). Mummy was so happy to see a lot of clothes and bottom for just $5 under clearance and samples section!!!!! After browsing through the shop for close to 2 hours, mummy managed to get 2 working tops, 1 working pants, 1 working shirt and 1 casual shirt, for just $5 per piece (one or two within $20 as well)!! Mummy said today is the happiest shopping day for her - able to get the clothes she needs in such a good price. Daddy mummy thank God for such a blessing. For those mummies to be in Melbourne, mummy strongly recommended this shop "Pea in a Pod". The one in Collingwood has the biggest range of clothes from clearance, sample to new arrival. Mummy said this can help a lot of mummies to be saving lots of expenses on maternity clothes.